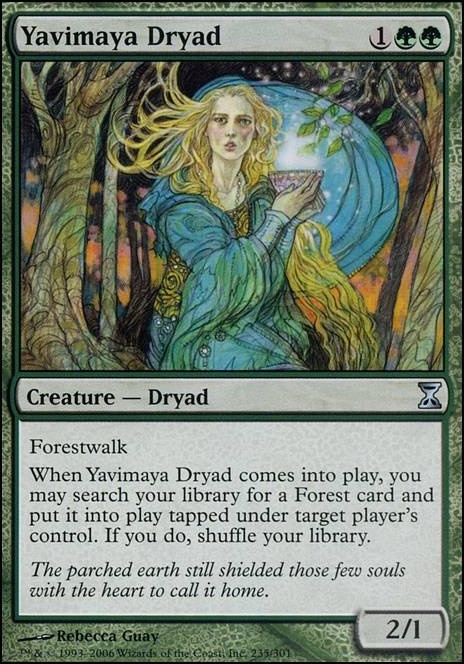 When Yavimaya Dryad enters the battlefield, you may search your library for a Forest card and put it into play tapped under target player's control. If you do, shuffle your library. OK, so looking at your deck list it's apparent you're going full on 'walker style. 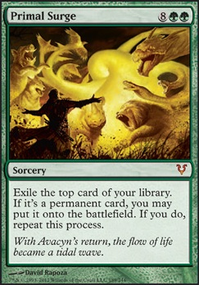 I think if you're going to keep it this way, you should think about including more creature wrath. Damnation, Wrath of God, Day of Judgment, and In Garruk's Wake come to mind. This way people can't just swing at you unimpeded. I also have a Jodah deck (Monsters, Friends, and the Right to Replicate), and I packed that sucker full of the kind of ramp where you pull land out of your library and put it into play. For extra benefit from all the land entering, I added Tatyova, Benthic Druid and Emeria Shepherd. 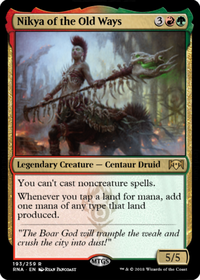 I think it's important to grab lots of land because you want to be able to use Jodah's ability as much as possible so you need all your colors. Now that you have tons of land at your disposal, you have room for a secret weapon. A personal favorite of mine, Biovisionary and Rite of Replication. I include a Silence to ensure no one effs with the win. Worst case, you draw a counterspell with Silence. 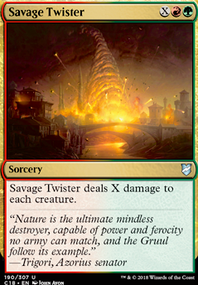 Cool thing with Biovisionary is, unlike most triggered instant-wins (like Mortal Combat), is this triggers at your endstep so you just do the thing, end your turn and win. I also recommend trying Muldrotha, the Gravetide. It will let you cast 'walkers from the grave. It's stupid good. For now, that's all I have. Gotta go back to work. Let me know what you think. Intergalactic_Hegemon, after coming back to this list, I've decided to not include the majority of spells that ramp up by a single mana, so Sea Scryer is no longer a spell that would fit to this list. (If you would like to see my reasoning for that, simply read the disclaimer at the top of the description of this list. Thanks!) As for one-time-use mana acceleration, my reasoning for not including them is this: If you use mana acceleration at the beginning of the game, your board state will be much better than each opponents', which causes opponents to become more afraid of you, which in turn makes it much harder for you to win as your opponents are more likely to be focusing their attention on you instead of on each other; if you use it towards the middle of the game or later, you give up explosiveness to do a smaller version of what these types of ramp spells do. Either way, since the average game is about 11 turns long, it makes no sense to try to replace cards that give a significant permanent boost in mana with ones that give a temporary boost, even if that boost is much higher. TheDeckMaker2300, Patron of the Moon is a fantastic inclusion, thank you! Crackbubba, Treasonous Ogre is a fantastic inclusion actually! Consider it this way: If a deck gains more than 9 life a turn, Treasonous Ogre can activate up to three times in a turn! I think your deck is suffering from a mild case of "I-want-to-do-too-many-things". Focus on what is it that you'd like the deck to do, and try to streamline it a little bit more. Do this by cutting the "win more" cards, that do nothing when you are behind and only help when you are already ahead. Secondly, I would increase the land count to around 37 and add cheap efficient ramp (preferably on creatures) to at least 8. 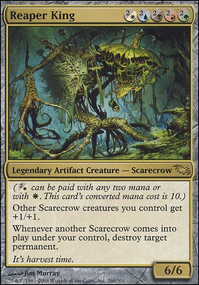 Farhaven Elf, Yavimaya Dryad, Wild-Field Scarecrow, and Yavimaya Elder will help you find and get more lands out. A third thing to do is to consider bringing the average cmc of the deck down a little. At four, it's a little high. Try bringing it down to 3,0-3,5. Lastly, I would increase the number of free sac outlets, and perhaps add another piece to your Mikaeus, the Unhallowed+Deathbringer Thoctar+free sac outlet combo to finish the game as a plan D, for the games that are just lasting too long. Murderous Redcap, Viscera Seer, Yahenni, Undying Partisan, and Ashnod's Altar are all good additions to the deck. Same goes for Death's Presence.